MBRM blows all others away from a technical standpoint. In fact, every sophisticated desk should have a copy. If you want a code library that is worth learning the ins and outs of, the only choice is MBRM. It may be difficult, but at least you get some real advantage in cutting-edge analytics and technology. MBRM has built far and away the best package in terms of cutting-edge code, technology and models. The Universal Add-ins handles a full spectrum of instruments and comprehensive range of functions, including pricing, risk management, trading and fund management. If your quant team is overdue for new toys, give them this to play with. MBRM has coded some of the most current models that have been showing up in the academic press. It's smart, and can actually provide an analytical and technical advantage, if that's what you are looking for. The specialised add-in suppliers are quickly turning their new models into commodity products and selling them globally. Mamdouh Barakat, managing director at Mamdouh Barakat Risk Management, says this process is getting quicker. "The lead time for commoditisation seems to be getting shorter due to the globalisation of the market". Article on the pioneers of Risk Technology listing "Financial Systems Software (Mamdouh Barakat)"
As in the US, most British software firms were founded by academics or bankers. A banker turned businessman is Mamdouh Barakat who left the now defunct junk bond trader, Drexel Burnham Lambert, in 1988 to develop a series of derivative pricing add-in modules. He is a pioneer of low-cost, third party software libraries for the front office. Using Microsoft's Dynamic Link Libraries (DLL) technology, his company has solved, he says, "a perennial problem in software development : how to access common algorithms - for example, analytical models for derivatives pricing and risk management - when working in different systems, without reinventing the wheel every time". The DLL technology allows users to access the algorithms from spreadsheets, trading systems or other applications. Drexel Burnham Lambert employed Mamdouh Barakat to look for arbitrage opportunities in the fixed-income sector. the prevailing attitude in the industry was that models should be proprietary secrets to be developed and used in-house only. Barakat, however, had other ideas. "I set up my company in the face of scepticism that large investment houses would ever buy in quantitative models from third-party software providers, on the grounds that they could develop them in-house and therefore maintain a competitive advantage" he recalls. "However, this argument overlooked the economies of scale in mass production, where the development and maintenance costs were spread among many users. Third-party providers also benefited from the feedback from many users around the world." Barakat launched a series of add-in modules for the Lotus 1-2-3 and Excel spreadsheets. The banks also had to justify the often higher costs of in-house development, In 1990, Barakat, for example, was selling his three Universal Add-ins for a total of £ 600. Barakat says: "We spent a huge amount of time optimising our binomial tree to run quickly, resulting in a hundred fold increase in speed. Without this improvement, we would not have been able to offer a workable product". Mamdouh Barakat Risk Management has introduced a software add-in for convertible bonds. Universal Convertibles Add-in handles portfolios of convertible bonds with structured calls, puts and conversion schedules, time-dependent credit spreads and other complex features. Users can link the add-in to most real-time feeds for continuous mark-to-market of portfolios. "Risk Management in Russia and the Baltic States"
Dr Mamdouh Barakat, a risk management expert, with over 10,000 clients world-wide, who also advises on Russian business operations, observes that firms working in Russia tend to be fairly new with less capital reserves. The regulatory, accounting, institutional support and credit rating regimes in Russia appear to be weaker than in the West, which makes credit risk from potential counter-party failures very important. Regarding Risk Management Practice in Russia and the Baltic States, "I am indebted to Dr. Mamdouh Barakat, Managing Director of MB Risk Management, for his kind assistance in this field and his earlier contribution in 'Credit Risk'." MBRM has released its "Universal Convertibles Add-in". It handles portfolios of Convertible Bonds with structured calls, puts and conversion schedules, time dependent credit spreads, discrete and continuous dividends, cross-currency and multiple conversion ratio resets. MBRM has also released a module for the pricing and risk management of Constant Maturity Swaps and Bermudan and American Style options on bonds or swaptions. The prepayment risk means that the holder of a mortgage-backed product is effectively short of multiple calls. "Because of that the holder has negative convexity, as opposed to holding ordinary bonds that are all positive convexity," says Mamdouh Barakat, managing director of software vendor MBRM in London. "Furthermore, the fact that the cash flow streams from the MBS are usually split into multiple classes, eg IOs and POs (Interest Only/Principal Only) makes the actual analysis of mortgage-backed securities even more difficult." New Software Releases : "MBRM Exchange Traded Options System - Exchange traded options pricing and risk management system". Trial risk software available on internet : Software house Mamdouh Barakat Risk Management has launched the Exchange Traded Options System for pricing and risk management. The package evaluates FTSE options on LIFFE and ETO contracts for other exchanges. MB Risk Management (MBRM), the London-based derivatives and risk management analytics vendor, has released a new version of its UNIVSWAP pricing system that incorporates American and Bermudan-style interest rate options. Some suppliers, however, make price a key selling point. London based Mamdouh Barakat Risk Management, for example, says that the low price of its add-in software for swaps and exotic option pricing and market risk management was a key selling point for customers that included a European Regulator. Mamdouh Barakat Risk Management has upgraded its Universal swap software add-in. Major features of version 7.5 of UNIVSWAP are a no-arbitrage term structure model for interest rates, a volatility term structure for caps, collars, floors and so on and automatic calibration of volatility term-structures using market prices. Mamdouh Barakat, managing Director of software supplier Mamdouh Barakat Risk Management, ... another London based model risk expert". There are many excellent systems out there to choose from. Bridge, EBS, Reuters and Mamdouh Barakat, for example, use the most up-to-date hardware, are constantly evaluating and up-dating software, provide excellent customer service, and have the benefit of being truly global. Prices of derivatives software have been dropping faster than you can say "leptokurtosis", but there is a new price barrier, software that comes free in the mail. MB Risk Management has recently begun applying mass-marketing techniques to options pricing models. 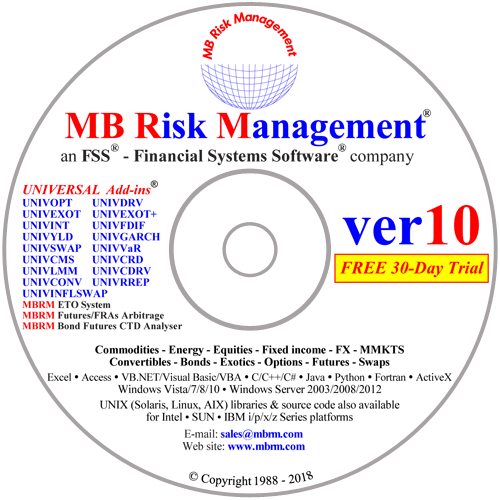 Thousands of people on derivatives mailing lists were mailed a CD-ROM containing a 30-Day license for a full collection of MB Risk Management's Universal derivatives software toolkit. "We've already seen a phenomenal response from this marketing initiative. Instead of having to see a demo and pay high fees just to find out if people like a product, we put a full, complete version of the product into their mailboxes. If users really don't like the software, they can always use it as a beer coaster." "Mamdouh Barakat of Mamdouh Barakat Risk Management in London is one of the leading exponents of the toolkit approach. His company has developed modules that facilitate decision support, derivative structuring and pricing, and what-if modelling. He points out that not only is the toolkit methodology on average about 10 times cheaper than the black-box approach [of comprehensive systems], but also encourages the creation of in-house expertise in leading aspects of the derivative software markets." "Select a vendor with an extensive installed user base, a vendor who has a real commitment to the industry and is going to stay in it." "Try to strike a balance between the need to select software which is truly state-of-the-art and gives you the edge you seek, and the need to work with a vendor who is reliable, has a good base of installed users, and who is financially sound." "Barakat's point about the need to choose systems that offers a range of models is recognised as crucially important for users keen to stay ahead of the game. Admittedly using more than one model means winding up with more than one answer, but at least that gives the opportunity of testing them in the marketplace and seeing which makes the most money." Derivatives trading and risk management software suppliers are also appreciating the value of the Internet. Mamdouh Barakat, managing director of London-based Mamdouh Barakat Risk Management, says: "We look at the Internet technologies as an opportunity. We are heavy users of the Internet already, as both an advertising medium and a means to distribute our software, both for trials and actual purchased copies. It is faster, cheaper and more reliable than the traditional order cycle." "The good news is that [MBRM's marketing] blurb is essentially valid throughout. Indeed in an hysterical feverpitch, it even goes so far as to say 'The prices are unbeatable - MBRM are prepared to beat any reasonable offer for similar software.' Moreover, even the initial prices are very reasonable". "The MBRM product is essentially no more difficult to operate than the Excel Spreadsheet itself. the worksheets are flexible, with spot colour in blood red helping the user discern which cells are modifiable". "What is truly outstanding about the MBRM add-ins is the combination of excellent functionality incorporated with ultra-keen prices. The UNIVSWAP program incorporates the package of all the other 4 Add-ins as well as its own key specialist functions and costs a very reasonable GBP 1,999". "Given the pedigree of its producer, the ease of use of the programs and their relative flexibility, it is difficult to fault any of the MBRM packages, particularly given their very reasonable price structure". FSS exemplifies how a retail software service vendor should make its impression! Its customer service is top notch. Performance advantages - The FSS package is clearly one of the fastest we tested. FSS excelled in customer service and speed of execution. FSS offers one of the most comprehensive pricing packages available. Of interest is their price warranty which states that they will beat the price of any competitor. The UNIVSWAP package incorporates one of the most extensive arrays of product analysis and modelling we have seen thus far for commercial spreadsheet add-ins. This provides a comprehensive and powerful toolkit to create complex models combining bonds, bond futures, options and swaps. The ability to seamlessly migrate through all available windows platforms with the same set of functions is a definite plus that is not shared by many, if any, of FSS's competitors. The add-ins are either listed as user defined functions or incorporated into pre-fabricated models, which are somewhat helpful. The sample spreadsheets assist users in getting familiar with functionality of the software. FSS is targeting the high end practitioners. There are several factors that gave the package an admirable rating. "Financial Systems Software is releasing its source code and, at the same time, its C object code. FSS, which has gone down the route of dynamic link libraries for pricing and analysing cash and derivative instruments, is thus making basic code available to any user programming in a 16/32-bit environment in the C, C++ or Visual C++ languages". "The simple nature of the add-in modules lends itself well to a stripped-down mail-order business. Much of FSS's market share was built by Barakat's strategy of lowering market overheads and thereby undercutting his competitor's prices – a trick he looks set to repeat with MB Risk Management". "The current dearth of equity derivatives software suppliers means that certain products have become de facto standards. For example, the FSS models are widely used for pricing". "One trader who works in the structured note area of a large Frankfurt-based bank found that the FSS system was an excellent alternative to starting a costly internal development effort. 'We purchased FSS after about two or three months of review. It was certainly more cost effective than hiring a programmer'. He has found the add-ins very flexible and an ideal vehicle for many one-off transactions handled at his desk. 'Everything we sell is different. These deals cannot be inputted into standard systems. But we can build these custom instruments and price them quickly in FSS' he says, adding, 'it does everything we want to do, and it's good value'". "FSS offers a solid range of products with comprehensive coverage of most derivatives products". "Reasonable price. FSS's add-ins sell separately and at a very competitive price". "The Bottom Line - FSS offers a solid high-value package." "The add-in libraries extend the usefulness of spreadsheets, giving them a versatility which specialised systems often lack. Combined with the ease with which spreadsheets can be programmed, this gives the user a high degree of control". "With a spreadsheet, you can design your own screens and look at things in a different way. For example, imagine that a dealer thinks of a wonderful new arbitrage. The last thing he wants to do is to tell a third-party provider because they might copy the screen and use it else-where. So an add-in gives more control and gives a securities house the ability to keep a secret internally". "Ted Rees, information technology director for money markets and foreign exchange at BZW in London says 'A spreadsheet allows you to get ideas down quickly and play with different scenarios". "The spreadsheet draws together the components, each of which can be made secure and subject to auditing". "FSS's Barakat says his company now uses Excel more as a platform for systems integration than a spreadsheet. Chemical's Brian Slater [managing director in charge of global technology at Chemical Bank in New York] agrees that spreadsheets have added value as integration tools. 'You can't consider spreadsheets as any different from other tools' says Slater, 'For us, they are another tool to supply solutions to the trader in a much quicker fashion and for traders, they can participate in the role of development much more closely than they ever have in the past' ". "Trading systems demand robust, secure operating systems. This has encouraged software houses to develop modular Windows versions of their systems. Affordability, usability, flexibility and compatibility are the main reasons for the shift towards Windows. Mamdouh Barakat, senior managing director of FSS - Financial Systems Software, describes his Windows-based solutions as, "an object-orientated building block approach providing unequalled speed, cost-effectiveness and flexibility for the users". "FSS managing director, Dr. Mamdouh Barakat, is expanding his operations on a global basis and moving to new London premises". "The famous FSS price pledge ('Our prices are unbeatable - we are prepared to beat any reasonable offer for similar software.') remains in place, as does the vendor's offer of three months of free telephone support". "FSS markets interest rate derivatives analytics to be used alongside Microsoft's Excel spreadsheet, priced at under £1,000 per licence". "Market sources say that FSS's software could be sold at considerably higher price tags to those currently in place". "Tightness of FSS's operations has allowed the vendor to cut down on overhead costs, and pass these savings to its customers". "National Westminster Bank in London, whose short-term arbitrage group uses an FSS-based spreadsheet linked to live data to identify arbitrage opportunities between eurolira futures and the underlying cash market". "The fact is often overlooked that an enormous amount can be achieved with just a humble spreadsheet. The days are long gone when institutions could safely leave it to their in-house spreadsheet wizards to work out the appropriate formulae and models in their spare time. One of the first people to recognise this development was former Drexel Burnham Analyst, Dr Mamdouh Barakat. City of London-based FSS has managed to clock up an impressive commercial base, including most of the major banks and financial institutions". "FSS has not suffered - unlike many other software companies - of being side-tracked down expensive product development routes as different directors flex their corporate egos". "You have huge economies of scale, enabling FSS to sell its products at what Dr Barakat describes as 'ridiculously inexpensive prices'. And for once, this is not a fatuous claim. All this talk about software 'costing less than a lunch in the City' also reflects a very shrewd marketing policy in that because the software is cheap, it is easy to buy. A 'little and often' pricing policy is only part of the story and FSS would not enjoy anything like its current success if it was not also hitting the market with products the customers want. Given Dr. Barakat's background as an analyst and a computer scientist, FSS has consistently been able to devise products that are both mathematically impeccable and commercially just what the markets are looking for". "I have to echo Dr. Barakat - [the price] is a 'ridiculously inexpensive' price for a mission critical financial software package". "In the early days it was probably the cheap price for a reliable product that helped establish FSS - after all why waste time devising your own spreadsheets when there is someone who can deliver the finished product for a few hundred pounds ? However since then the company has built up such a large user-base that it is now on the receiving end of an enormous amount of feedback, thus enabling FSS to further refine its products and ensure it keeps pace with the market's shifting needs". "FSS - now six years old - is a veteran in the market for financial spreadsheet add-ins. FSS was one of the first companies to market low-cost spreadsheet add-ins for analysing derivatives". "The Vendor sells its add-ins by mail order in dynamic link library (DLL) format, allowing easy integration with both spreadsheets and application development environments such as Microsoft's Visual Basic and Visual C++". "Financial Systems Software has launched an upgrade to its Universal Yield Add-in and Universal Options Add-in. Both now support Excel on the Apple Macintosh". "Before the City's Big Bang, hand held calculators were enough to cope with most financial instruments, but today the analytics used in the capital markets are becoming very sophisticated. Spreadsheets can cope with the new instruments, but in themselves, they can do very little. Somebody has to put in the formulae, calculations and models, and this all takes time. Time is one thing capital market traders and analysts do not have, and specialist outfits are springing up to exploit this niche".
" 'I knew Mamdouh from our days at Drexels' recounts George Tintor of Indosuez Capital Markets's structured finance group. 'He showed me the software, told me what I can do with it, and I said : I'll take it'. 'If Mamdouh says he has something, why should I re-invent the wheel when I can get a piece of software which does it for me' ".